MONKEYS ARE MY FRIEND: BUTTONS! I finally got my buttons today! Yay! Of course, I was so busy that I wasn't able to put the buttons on until late tonight. But what matters is that I got it done! Which means I have a sweater! Anyway, for the absolute best results, I probably should have used some kind of bracer button on the back of the buttons to give a bit of support because they are quite large (just under 1.5") and the sweater is a more drape-y llama (versus a sturdier, springier wool). Eh, live and learn. But I don't think it will be a problem. (Hopefully those don't go down as famous last words.) 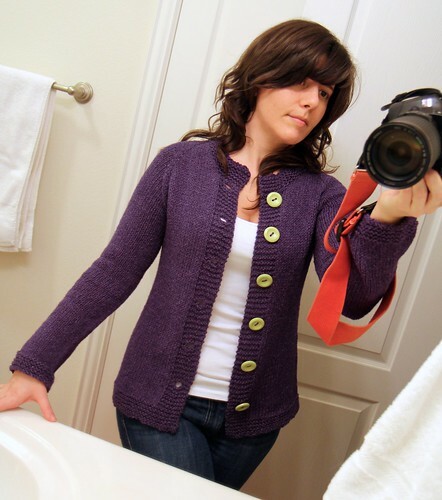 And honestly, I pretty much never button cardigans anyway so they shouldn't get much of a work out. Hopefully the sweater will get a lot of use, though! I was wearing a tank top underneath it in the above photo and I think it is a good sign that I didn't find the sweater itchy. And lately I've been finding everything itchy. I've had to cut out tags in the back of shirts that I've worn for years. No idea why my skin is being so sensitive lately, but it didn't mind the llama & silk so yay! Next up: seaming my purse (and then learning to use my sewing machine to line it) and working on my Turkish bed socks. Then, once those are done, I'm thinking another pair of socks and another sweater! I'm insane! Thank you! I'm pretty pleased with it!